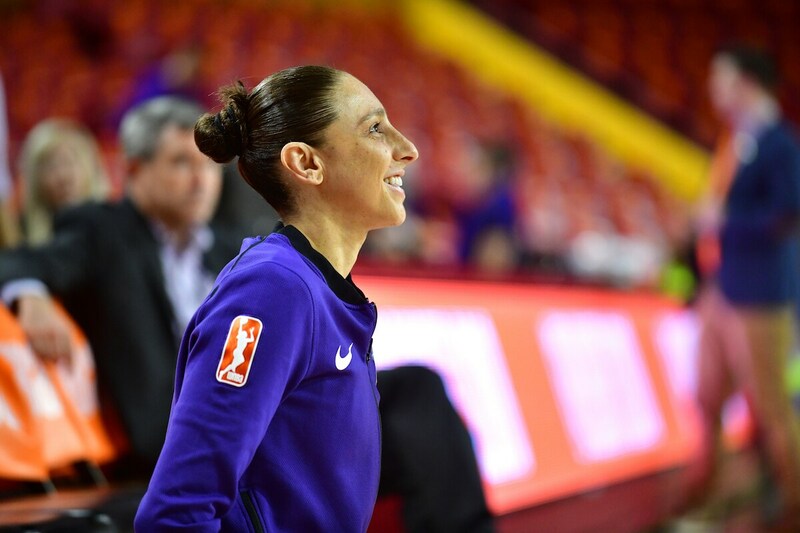 TEMPE, AZ - AUGUST 21: Diana Taurasi #3 of the Phoenix Mercury looks on before the game against the Dallas Wings in Round One of the 2018 WNBA Playoffs on August 21, 2018 at Wells Fargo Arena in Tempe, Arizona. 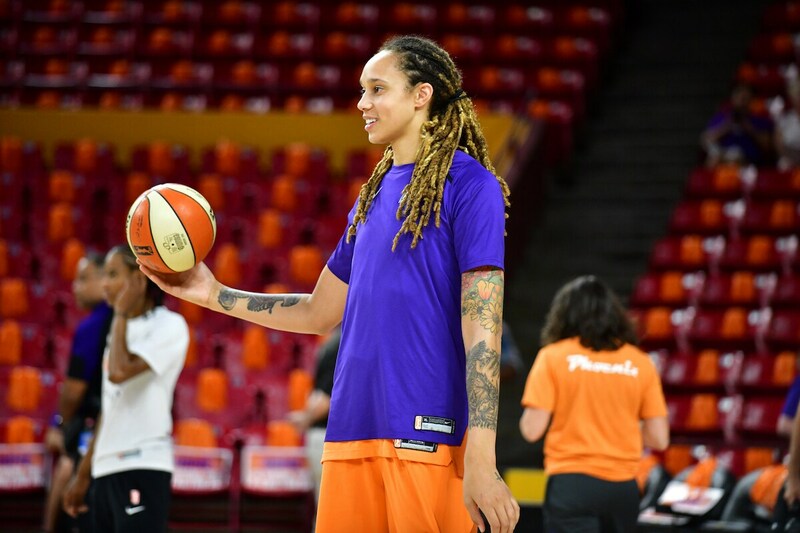 TEMPE, AZ - AUGUST 21: Brittney Griner #42 of the Phoenix Mercury looks on before the game against the Dallas Wings in Round One of the 2018 WNBA Playoffs on August 21, 2018 at Wells Fargo Arena in Tempe, Arizona. 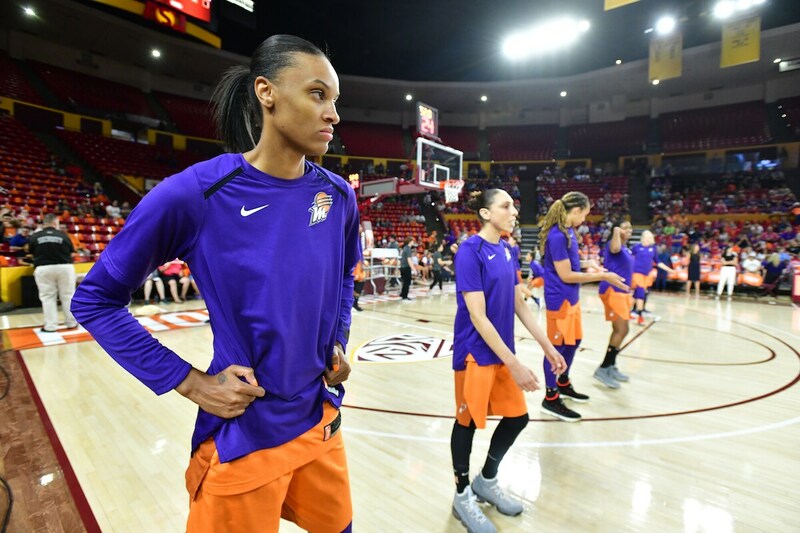 TEMPE, AZ - AUGUST 21: DeWanna Bonner #24 of the Phoenix Mercury looks on during the national anthem before the game against the Dallas Wings in Round One of the 2018 WNBA Playoffs on August 21, 2018 at Wells Fargo Arena in Tempe, Arizona. TEMPE, AZ - AUGUST 21:Diana Taurasi #3 of the Phoenix Mercury warms up before the game against the Dallas Wings in Round One of the 2018 WNBA Playoffs on August 21, 2018 at Wells Fargo Arena in Tempe, Arizona. 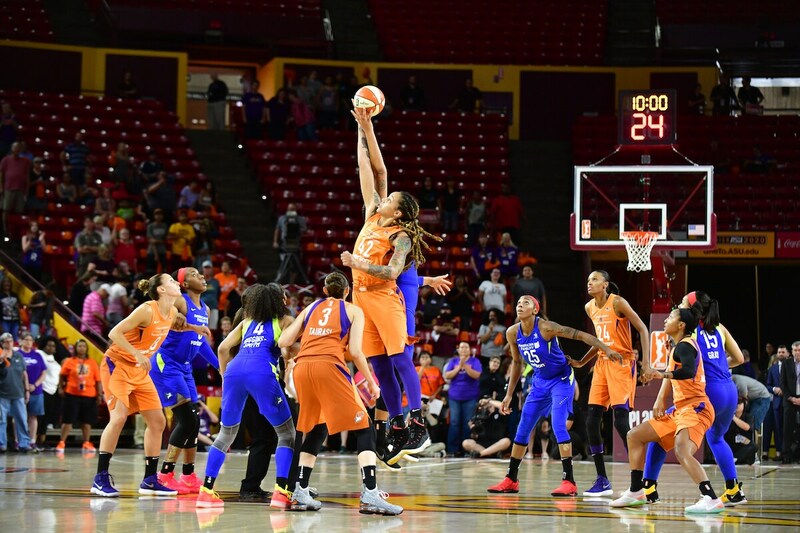 TEMPE, AZ - AUGUST 21: Tip off between Elizabeth Cambage #8 of the Dallas Wings and Brittney Griner #42 of the Phoenix Mercury at the start of the game in Round One of the 2018 WNBA Playoffs on August 21, 2018 at Wells Fargo Arena in Tempe, Arizona. TEMPE, AZ - AUGUST 21: Head Coach Sandy Brondello looks on during the game against the Dallas Wings in Round One of the 2018 WNBA Playoffs on August 21, 2018 at Wells Fargo Arena in Tempe, Arizona. 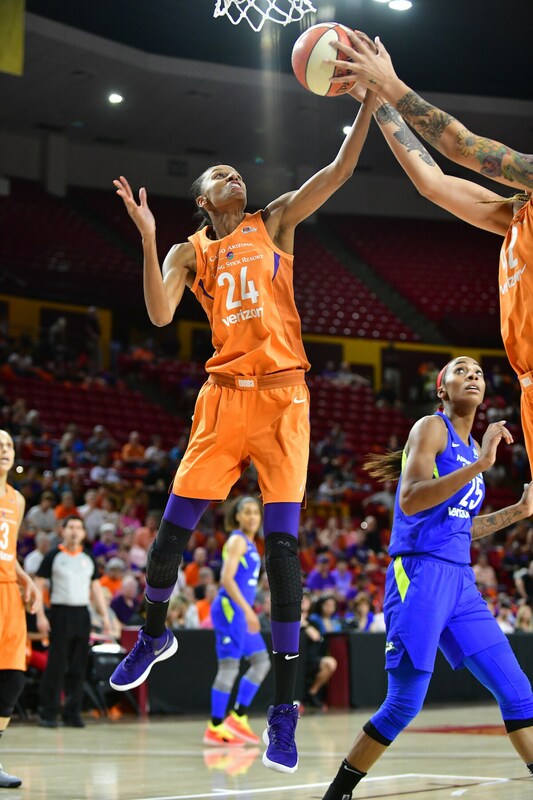 TEMPE, AZ - AUGUST 21: DeWanna Bonner #24 of the Phoenix Mercury handles the ball against the Phoenix Mercury in Round One of the 2018 WNBA Playoffs on August 21, 2018 at Wells Fargo Arena in Tempe, Arizona. 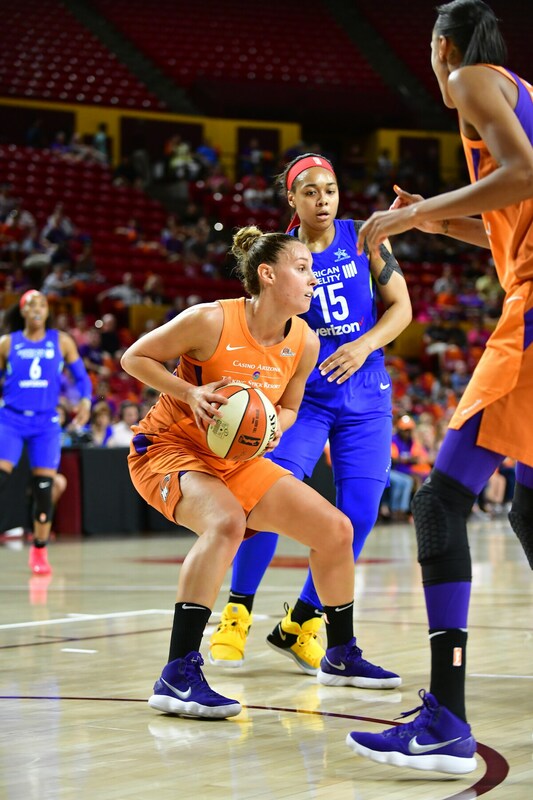 TEMPE, AZ - AUGUST 21: Stephanie Talbot #8 of the Phoenix Mercury handles the ball against the Dallas Wings in Round One of the 2018 WNBA Playoffs on August 21, 2018 at Wells Fargo Arena in Tempe, Arizona. 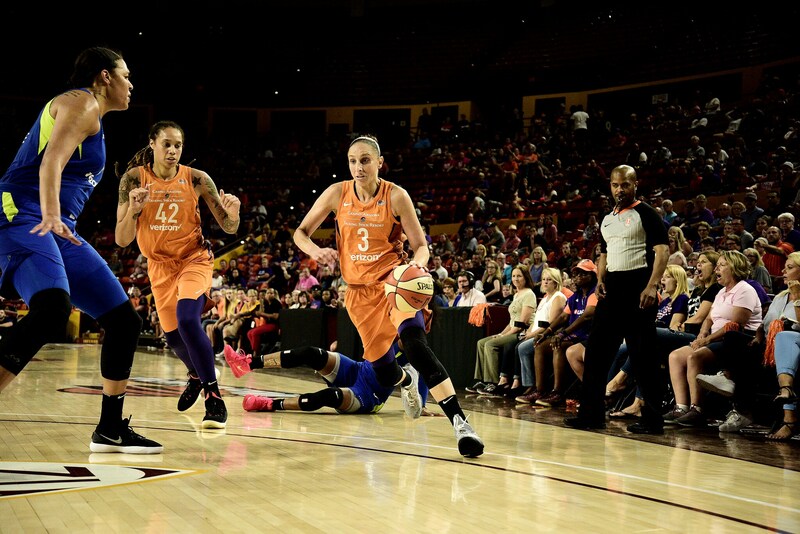 TEMPE, AZ - AUGUST 21: Diana Taurasi #3 of the Phoenix Mercury handles the ball during the game against the Dallas Wings in Round One of the 2018 WNBA Playoffs on August 21, 2018 at Wells Fargo Arena in Tempe, Arizona. TEMPE, AZ - AUGUST 21: DeWanna Bonner #24 of the Phoenix Mercury shoots the ball during the game against the Dallas Wings in Round One of the 2018 WNBA Playoffs on August 21, 2018 at Wells Fargo Arena in Tempe, Arizona. 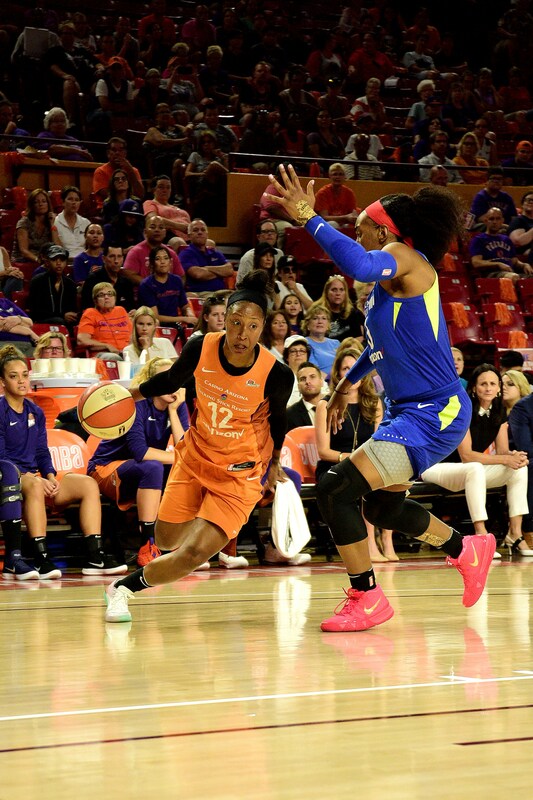 TEMPE, AZ - AUGUST 21: Briann January #12 of the Phoenix Mercury handles the ball during the game against the Dallas Wings in Round One of the 2018 WNBA Playoffs on August 21, 2018 at Wells Fargo Arena in Tempe, Arizona. TEMPE, AZ - AUGUST 21:Brittney Griner #42 of the Phoenix Mercury drives to the basket against the Dallas Wings in Round One of the 2018 WNBA Playoffs on August 21, 2018 at Wells Fargo Arena in Tempe, Arizona. TEMPE, AZ - AUGUST 21: Diana Taurasi #3, Brittney Griner #42 and DeWanna Bonner #24 of the Phoenix Mercury look on during a huddle in Round One of the 2018 WNBA Playoffs on August 21, 2018 at Wells Fargo Arena in Tempe, Arizona. TEMPE, AZ - AUGUST 21: Leilani Mitchell #5 of the Phoenix Mercury reacts during the game against the Dallas Wings in Round One of the 2018 WNBA Playoffs on August 21, 2018 at Wells Fargo Arena in Tempe, Arizona. TEMPE, AZ - AUGUST 21: Diana Taurasi #3 of the Phoenix Mercury speaks with the media after the game against the Dallas Wings in Round One of the 2018 WNBA Playoffs on August 21, 2018 at Wells Fargo Arena in Tempe, Arizona.